Ever since we removed the carpets from our main floor I have been searching for something soft and cuddly for the kids to lounge in. 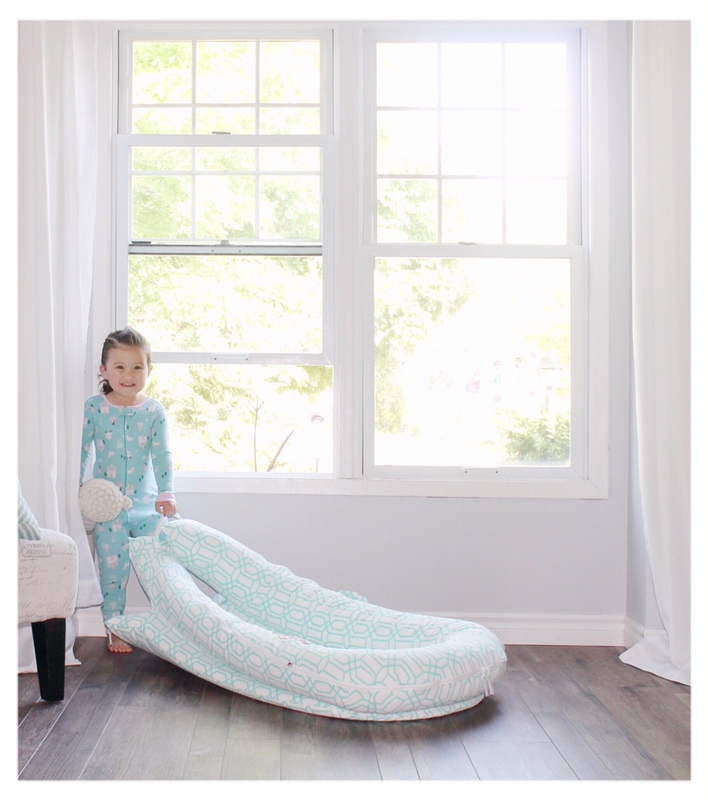 The DockATot did just that. The DockATot is a lightweight multi-functional lounging, playing, chilling, resting and snuggling dock that you can take anywhere. It provides a cozy, safe and non-toxic environment and comes in two sizes; Deluxe for 0-8 Months & Grand 9-36 months. 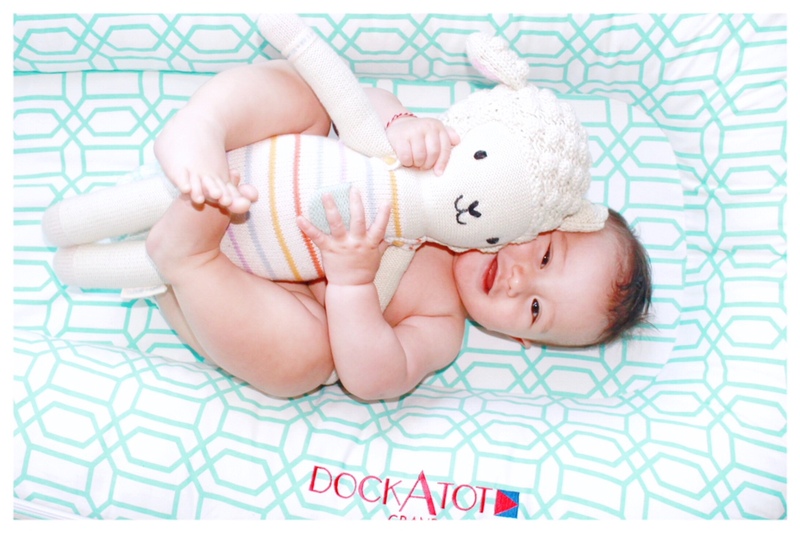 The DockATot cover used on both the Grand and Deluxe docks are 100% cotton, breathable and washable. 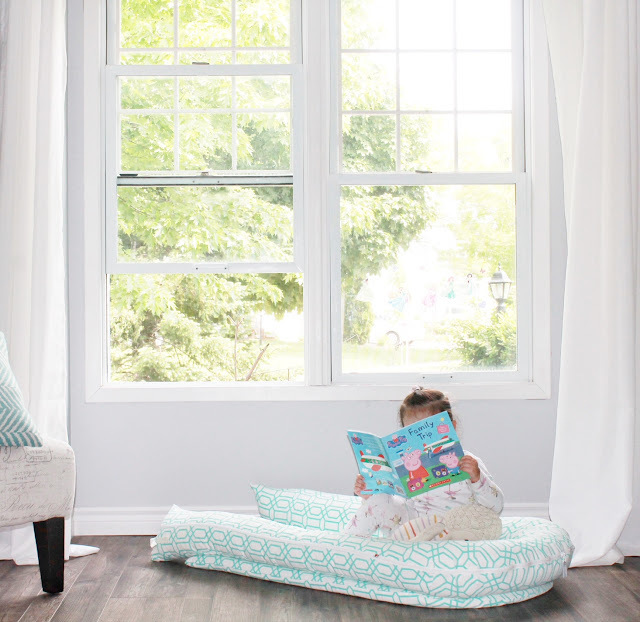 The filling is made from nontoxic fibers that offers excellent air-permeability and helps keep babies at the perfect temperature; cooler in the summer and warmer in the winter months. When I first thought of the DockAtot, I thought of Baby Bean. Mostly because social media is littered with babies in their DockATots. When the DockATot Grand actually arrived Baby Peanut instantly grew attached to it. 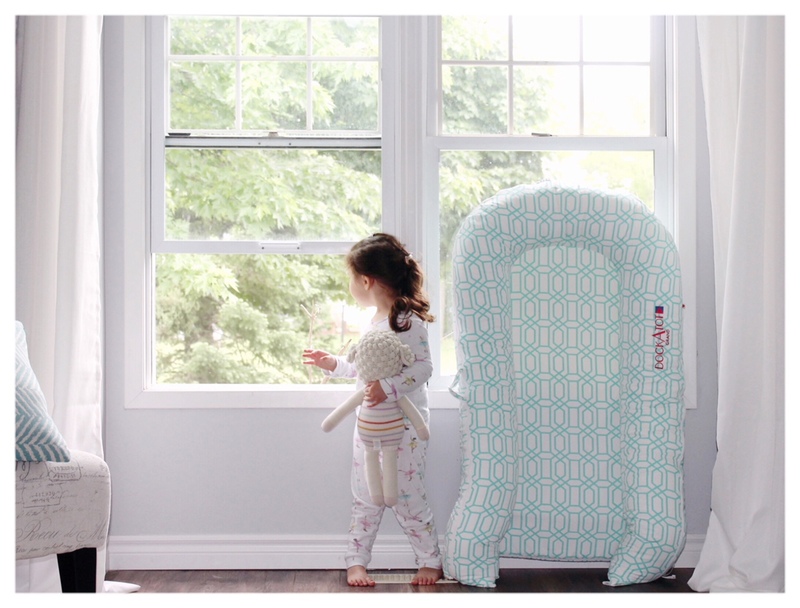 Baby peanut takes our DockATot Grand everywhere and absolutely loves it. I love walking into the room and finding her snuggled in the DockATot reading her favorite book. She also uses it for quiet time. When I’m putting Baby Bean down for his nap she will pull the DockATot to the front window and lounge in it until I’m back. When I can get the DockATot away from Baby Peanut, I love using it during bath time. It’s probably my favorite way to use it with Baby Bean. When I’m home alone and bathing both of them it’s a lifesaver. I place the DockATot on a safe spot on the the floor and when I’m done bathing Baby Bean i place him in the DockATot and he lounges in the pod while I finish bathing Baby Peanut. I love how the DockATot allows me to bathe them both safely. Now that our deck renovation are completed, Baby Peanut loves lounging in the DockATot outdoors. At first, I was reluctant with this idea but because the cover is so easy to remove and wash, I’m all for it. With that being said, I do wish there was an extra handle at the top of the dock so that it is easier for her to pull across the grass. She currently uses the other end with the snaps but our DockATot may be slightly defective because the buckle keeps coming undone. No biggie she just uses a little more elbow grease to get it where she wants it. We do not use the DockATot for sleeping, sleep transition or napping and cannot comment on that. We use the DockATot purely for lounging/ playtime and absolutely love it. Although it comes with a pretty steep price tag $299USD for the Grand, the DockATot packs a punch. It is well made, high-quality and stylish. It comes in a plethora of colors and patterns that will surely suit everyone. We have the Minty Trellis one because I have a slight obsession with all things turquoise. It’s absolutely beautiful and integrates well with the rest of the decor. Goodbye May and hello June! Last month flew by and when I think about our favorites things, The Honest Company hair care products come top of mind. Baby peanut’s hair has been crazy and a little hard to manage because of the warmer weather. She has her dad to thank for that. I have been looking for something to tame the frizz and finally found it. 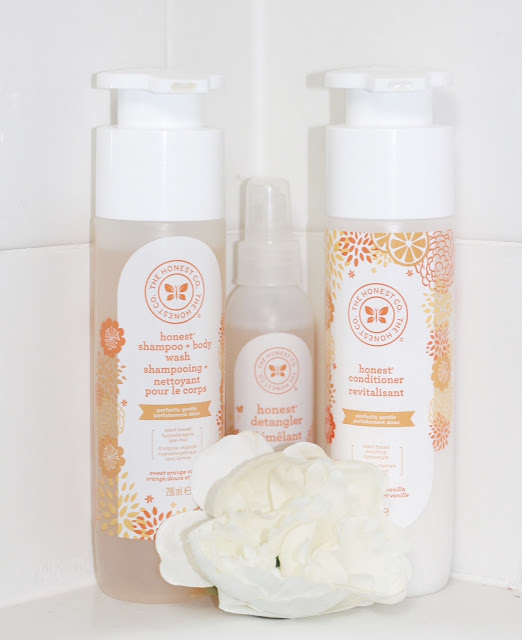 We (yes I use it too) have been using the honest shampoo, conditioner and detangler every day and absolutely love it. It’s hypoallergenic, tear-free, colour-safe, vegan, biodegradable, pH balanced, naturally non-toxic and best of all tames the frizz! It does take a little more work switching from a 2 in 1 shampoo to a separate shampoo and conditioner but the results are so worth. 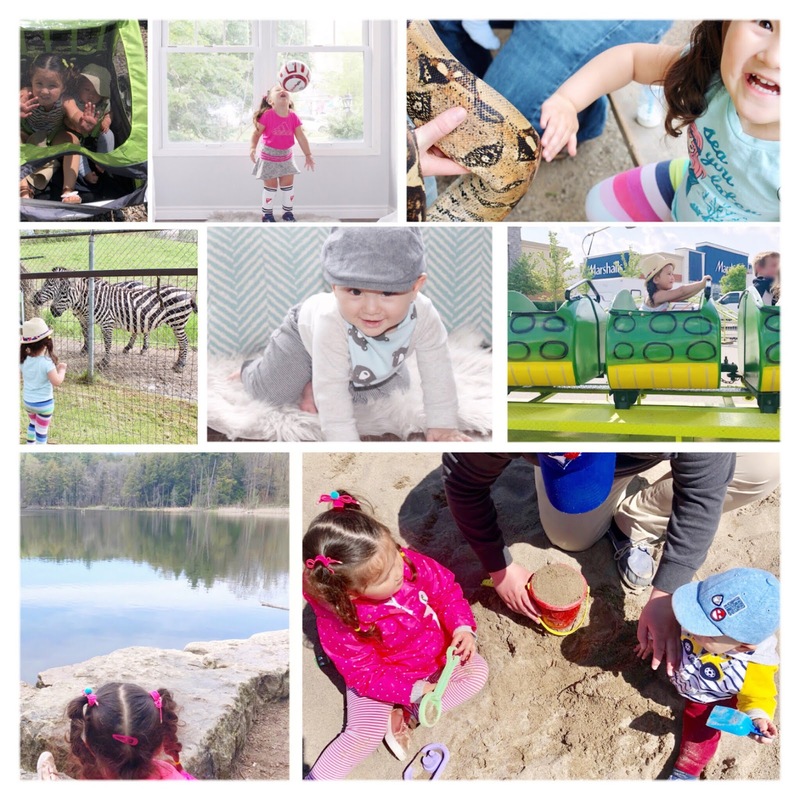 The month of May was the month of firsts and my favourite month so far. The weather cooperated and we finally took our first family bike ride. We haven’t been on bikes for years and boy, it is a lot harder than I remember. The kids loved the trailer and the Mr lost a pedal and had to walk his bike back. We celebrated mother's day as a foursome this year. We spent the day under the sun; hiking, playing in the sand, picnicking and then ended it with a family swim. Baby bean played in the sand for the first time and tried to eat it every five minutes. He loved splashing in the pool and maybe drank a little too much water. We also took our first trip to the zoo where baby peanut was almost attacked by a peacock but despite the scare, she still managed to have a blast. We saw lots of animals and even got to pet a snake. Our first Carnival trip also happened this month. Baby peanut loved the ferris wheel, rode on her first roller coaster solo and won her first doll. She’s growing up! Baby bean is a crawling machine and can stand on his own. He is fast, curious and gets into almost everything. He is the complete opposite of his sister who didn't even need baby gates at this age. He’s still drooling like nobody’s business with no signs of teeth yet. He looked the Mr in the eye one night and said dada for the first time. We’re still working on mama. Maybe next month. Baby peanut has been pretty busy this month. She rode on her first scooter, started soccer and is slowly starting to embrace swim lessons. She loves being in the water but absolutely goes bat crazy if it gets on her face.